Fastec Imaging has brought the same ease-of-use of today’s digital cameras to the world of high speed imaging. Our goal at Fastec has always been to demystify and simplify the traditionally complicated workflow of a high speed camera. Combining a sleek hand-held form factor and an intuitive touch-screen menu with an ultra-fast sensor, a built in high-performance SSD, and a four-hour battery, the TS4 is a completely portable, self -contained high-speed camera system. With the TS4, there is no need for an external PC for camera set up, control, or image viewing. Also eliminated is the requirement for any bulky external image storage system such as an external raid array. The TS4 provides everything you could possibly need for an entire day of high-speed shooting in one simple, hand-held package. For some laboratory and industrial uses, Fastec’s thrifty IL4 offers the same powerful feature set in a slimmer package without the battery and touch-screen display. In “FasCorder mode”, the TS4 and IL4 can be configured to make multiple high-speed recordings with lengths from less than a second, up to a few hours. The footage is all played back on one timeline, making it easy to find, compare and save the wanted portions. For recording short, rapidly recurring events, switch to FasFire mode. FasFire lets you capture shorter bursts of high-speed footage at higher frame rates without having to stop the recording process to save images. Essentially, FasFire moves the image downloading function to the background while you continue to shoot live high-speed events. FasFire is both a time saver and an image storage saver. Fastec Imaging is a global manufacturer of digital high-speed imaging systems based in San Diego, CA. The company specializes in uniquely portable and affordable high-speed camera systems, including handheld, point-and-shoot systems, compact PC-controlled cameras, and long duration record systems. 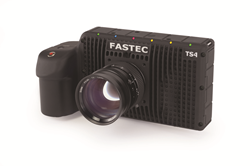 Fastec cameras are used in many applications, including engineering, industrial manufacturing, packaging, medical and academic research, biomechanics, military range testing, sports performance, and broadcast entertainment. For additional information, please visit Fastecimaging.com.